Hannah knew how to deal with people going through an emotionally and physically draining valley. Her solution was simple but powerful. It was just the unsolicited encouragement that Joni and I so needed at the time. When this cancer journey began, we learned a lot of hard lessons. One of the hardest to swallow was people’s reactions, how those close to us dealt with tragedy and illness. We had expectations of who would be there for us during the storm, but those expectations were rarely correct. Some people that we were sure would be steadfast became invisible. Others who we would have wagered the mortgage on to be constant encouragers became awkward and distant. When your expectations are met with inconsistent responses from friends and family, it can devastate your spirit and lead to despair. Although reasons were never given, I could guess why people struggled with our situation, based on the unique baggage they brought to their own story. Perhaps cancer made them fear their own mortality. Some acted as if cancer is contagious. Perhaps they worried they might say the wrong thing. Others might have felt pressure to make sense of a senseless situation or the need to figure out the spiritual reason for the trial, and when they had no answer to give us, they retreated. I understand all that now, but at the time it hurt. There was incredible comfort in her presence. She was right. That was all I needed—presence. When Joni was sick with cancer, all we needed from friends and fellow followers of Jesus was caring presence. The theology of why bad things happen could wait. The go-to verse that “all things work together for good” (Romans 8:28, kjv) could be explored when time gave perspective. You don’t need to explain or spiritualize trials. You need to be present and willing to walk with your friend or loved one in grace and love. Simple, yet incredibly powerful. Remember me mentioning Job and his suffering in the introduction? At first, Job’s friends were fantastic empathizers. When they simply sat with Job and grieved with him, I am sure he took comfort in these men who cared enough to be present. But then they decided to speak their piece. They resorted to the familiar default mode of needing to “figure out” what Job did to trigger his suffering. They tried to explain what they could not understand. We had a few “Job friends” in our cancer journey. God was faithful to provide caring people to walk with Joni and me. We thanked Him for those He prompted to love us, instead of wondering why others were not there. That was a spiritual turning point for us. During Joni’s cancer, Hannah obviously had no idea why we were sad. She had no more understanding of Joni’s disease than she would later have of her own prognosis. But she could sense our sorrow and she was present in the moment. Joni’s breast cancer treatment included surgery and a year of chemotherapy followed by weeks of radiation. We joked about our weekly dates at the “Slow-Drip Spa,” but there was not much humor to be found in the aftermath of those sessions. Joni fought nausea and her plummeting white blood cell counts were dangerously low, compromising her recovery. One day after we returned home from Joni’s chemotherapy session, she went straight to the bedroom, exhausted, to try to sleep off the nausea. I sat on the couch in our living room staring at nothing as I tried to process all that Joni was going through. I tossed the ball to her, but she did not play with the normal zeal that she had during our games of catch. This day Hannah caught the ball, calmly brought it back, and gently dropped it in my lap. It was as if she was doing this for me and not her. She was giving me a few moments of respite from my fears. I don’t recall another time that she played in that way. A recent study done by Goldsmiths College in London suggests that dogs may respond more to our emotions than any other species, including our own. According to the study conducted by Dr. Deborah Custance and Jennifer Mayer, dogs will even approach strangers to comfort them, regardless of expectation of reward or care. That certainly makes them different from many humans. The researchers did the following experiment. Eighteen pet dogs, spanning a range of ages and breeds, were exposed to four separate 20-second experimental conditions in which either the dog’s owner or an unfamiliar person pretended to cry, hummed in an odd manner, or carried out a casual conversation. 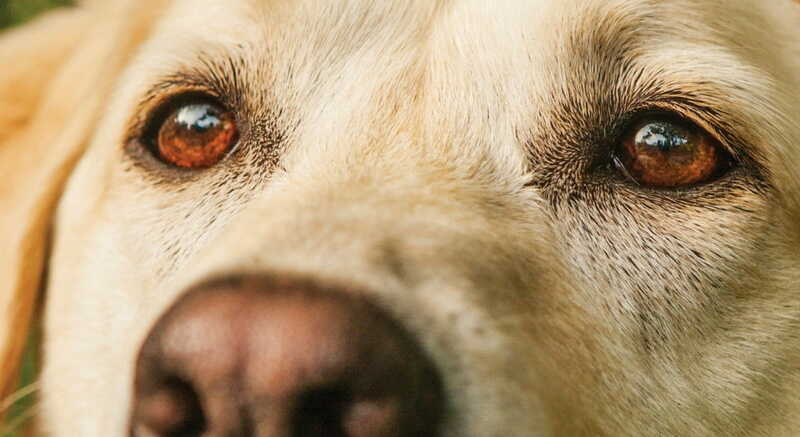 The dogs demonstrated behaviours consistent with an expression of empathic concern. Significantly more dogs looked at, approached and touched the humans as they were crying as opposed to humming, and no dogs responded during talking. Humming was included because it is an unusual sound that might arouse the curiosity of the dogs. But interestingly enough, the dogs consistently reacted to the person who was crying instead of the ones humming or talking, regardless of whether the person crying was a dog’s owner or a complete stranger. Jennifer Mayer summed up the surprising result, which was amazing to me. I think God has given us a model of walking, breathing grace in these amazing creatures. The Holy Spirit senses our hearts and literally interprets our anguish to the Father. God desires that we simply be present with Him. We don’t need to pray eloquent psalms of petition. We simply put our heads in the lap of Abba Father and say, “I’m here.” And isn’t it interesting that it is in this very intimate context of submission and tender dependence on the Holy Spirit that the oft-quoted phrase about how “all things work together for good” occurs? We isolate the verse about “everything working for good” from its context and throw it out as “comfort” for those who are suffering. Paul says that God is with us in our suffering, not just for one specific event, but for all of the trials we will face in our lives. All of them will be ultimately redeemed for those who love God. The purpose of our trials is not necessarily to have things work out neatly, according to our desires. Romans 8:29 says, “God knew his people in advance, and he chose them to become like his Son.” God chose believers to become like His Son. All of these trials together will cause us to become more like Jesus. That may or may not mean a particular event will work out well. How often have we wounded a hurting soul with our shallow spiritualizing when he or she just needed a friend? Learning to be present for a friend or a loved one is a precious skill. Henri Nouwen captures this heart of friendship well. It starts with being present, a lesson well taught by my friend Hannah. She gave me a clear example of being present when your friend is hurting. Just be present. Not all-knowing. Not awkwardly fumbling for words. Simply present. Tonight I got into bed late, and Hannah got up from her comfy bed and walked to my side. Maybe she needed my presence. Maybe she sensed my need for a therapeutic ear scratch. I suspect the truth is that both of us had needs that were met by that simple action of presence and affection. That is how it works when we drop our fears and selfishness to make ourselves lovingly present in a loved one’s pain. It is therapeutic for everyone involved. During Joni’s difficult cancer trial we learned that the peace that surpasses all understanding is real. We lived it and we got through a very trying year by leaning on each other, great doctors, good friends, God’s grace, and lots of Hannah nuzzles.